For this date’s post we welcome back to Executed Today the prolific pen of Alexandre Dumas, here working on the “fictional” side of his familiar historical fiction genre. Dumas has already sown both seeds when he dates his narrative via van Baerle’s will, written when the fictional main character is in danger of succumbing to the same cataclysm that swallowed up his godfather: already smitten with Rosa, he purposes to bequeath her the bulbs, whose rare product will be worth a bounty. On this day, the 23d of August, 1672, being on the point of rendering, although innocent, my soul to God on the scaffold, I bequeath to Rosa Gryphus the only worldly goods which remain to me of all that I have possessed in this world, the rest having been confiscated; I bequeath, I say, to Rosa Gryphus three bulbs, which I am convinced must produce, in the next May, the Grand Black Tulip for which a prize of a hundred thousand guilders has been offered by the Haarlem Society, requesting that she may be paid the same sum in my stead, as my sole heiress, under the only condition of her marrying a respectable young man of about my age, who loves her, and whom she loves, and of her giving the black tulip, which will constitute a new species, the name of Rosa Barlaensis, that is to say, hers and mine combined. So may God grant me mercy, and to her health and long life! Cornelius had not three hundred paces to walk outside the prison to reach the foot of the scaffold. At the bottom of the staircase, the dog quietly looked at him whilst he was passing; Cornelius even fancied he saw in the eyes of the monster a certain expression as it were of compassion. The dog perhaps knew the condemned prisoners, and only bit those who left as free men. The shorter the way from the door of the prison to the foot of the scaffold, the more fully, of course, it was crowded with curious people. These were the same who, not satisfied with the blood which they had shed three days before, were now craving for a new victim. And scarcely had Cornelius made his appearance than a fierce groan ran through the whole street, spreading all over the yard, and re-echoing from the streets which led to the scaffold, and which were likewise crowded with spectators. The scaffold indeed looked like an islet at the confluence of several rivers. In the midst of these threats, groans, and yells, Cornelius, very likely in order not to hear them, had buried himself in his own thoughts. And what did he think of in his last melancholy journey? Neither of his enemies, nor of his judges, nor of his executioners. He thought of the beautiful tulips which he would see from heaven above, at Ceylon, or Bengal, or elsewhere, when he would be able to look with pity on this earth, where John and Cornelius de Witt had been murdered for having thought too much of politics, and where Cornelius van Baerle was about to be murdered for having thought too much of tulips. Only there was still a chance, just as it had happened before to M. de Chalais, to M. de Thou, and other slovenly executed people, that the headsman might inflict more than one stroke, that is to say, more than one martyrdom, on the poor tulip-fancier. Yet, notwithstanding all this, Van Baerle mounted the scaffold not the less resolutely, proud of having been the friend of that illustrious John, and godson of that noble Cornelius de Witt, whom the ruffians, who were now crowding to witness his own doom, had torn to pieces and burnt three days before. He knelt down, said his prayers, and observed, not without a feeling of sincere joy, that, laying his head on the block, and keeping his eyes open, he would be able to his last moment to see the grated window of the Buytenhof. At length the fatal moment arrived, and Cornelius placed his chin on the cold damp block. But at this moment his eyes closed involuntarily, to receive more resolutely the terrible avalanche which was about to fall on his head, and to engulf his life. A gleam like that of lightning passed across the scaffold: it was the executioner raising his sword. Van Baerle bade farewell to the great black tulip, certain of awaking in another world full of light and glorious tints. Three times he felt, with a shudder, the cold current of air from the knife near his neck, but what a surprise! he felt neither pain nor shock. He saw no change in the colour of the sky, or of the world around him. Then suddenly Van Baerle felt gentle hands raising him, and soon stood on his feet again, although trembling a little. He looked around him. There was some one by his side, reading a large parchment, sealed with a huge seal of red wax. And the same sun, yellow and pale, as it behooves a Dutch sun to be, was shining in the skies; and the same grated window looked down upon him from the Buytenhof; and the same rabble, no longer yelling, but completely thunderstruck, were staring at him from the streets below. Van Baerle began to be sensible to what was going on around him. His Highness, William, Prince of Orange, very likely afraid that Van Baerle’s blood would turn the scale of judgment against him, had compassionately taken into consideration his good character, and the apparent proofs of his innocence. His Highness, accordingly, had granted him his life. Cornelius at first hoped that the pardon would be complete, and that he would be restored to his full liberty and to his flower borders at Dort. But Cornelius was mistaken. To use an expression of Madame de Sevigne, who wrote about the same time, “there was a postscript to the letter;” and the most important part of the letter was contained in the postscript. In this postscript, William of Orange, Stadtholder of Holland, condemned Cornelius van Baerle to imprisonment for life. He was not sufficiently guilty to suffer death, but he was too much so to be set at liberty. But Cornelius forgot that the Seven Provinces had seven prisons, one for each, and that the board of the prisoner is anywhere else less expensive than at the Hague, which is a capital. His Highness, who, as it seems, did not possess the means to feed Van Baerle at the Hague, sent him to undergo his perpetual imprisonment at the fortress of Loewestein, very near Dort, but, alas! also very far from it; for Loewestein, as the geographers tell us, is situated at the point of the islet which is formed by the confluence of the Waal and the Meuse, opposite Gorcum. 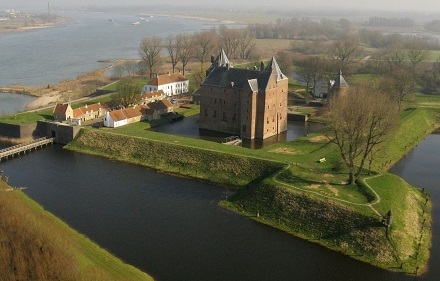 Van Baerle was sufficiently versed in the history of his country to know that the celebrated Grotius was confined in that castle after the death of Barneveldt; and that the States, in their generosity to the illustrious publicist, jurist, historian, poet, and divine, had granted to him for his daily maintenance the sum of twenty-four stivers. Then suddenly a terrible thought struck him. Whilst Cornelius was engaged with his own thoughts, a coach had driven up to the scaffold. This vehicle was for the prisoner. He was invited to enter it, and he obeyed. His last look was towards the Buytenhof. He hoped to see at the window the face of Rosa, brightening up again. But the coach was drawn by good horses, who soon carried Van Baerle away from among the shouts which the rabble roared in honour of the most magnanimous Stadtholder, mixing with it a spice of abuse against the brothers De Witt and the godson of Cornelius, who had just now been saved from death. Among all the spectators whom Van Baerle’s execution had attracted to the Buytenhof, and whom the sudden turn of affairs had disagreeably surprised, undoubtedly the one most disappointed was a certain respectably dressed burgher, who from early morning had made such a good use of his feet and elbows that he at last was separated from the scaffold only by the file of soldiers which surrounded it. Many had shown themselves eager to see the perfidious blood of the guilty Cornelius flow, but not one had shown such a keen anxiety as the individual just alluded to. The most furious had come to the Buytenhof at daybreak, to secure a better place; but he, outdoing even them, had passed the night at the threshold of the prison, from whence, as we have already said, he had advanced to the very foremost rank, unguibus et rostro — that is to say, coaxing some, and kicking the others. This burgher was no other than Mynheer Isaac Boxtel, who since the arrest of Cornelius had come to the Hague to try if he could not get hold of the three bulbs of the black tulip. Boxtel had at first tried to gain over Gryphus to his interest, but the jailer had not only the snarling fierceness, but likewise the fidelity, of a dog. He had therefore bristled up at Boxtel’s hatred, whom he had suspected to be a warm friend of the prisoner, making trifling inquiries to contrive with the more certainty some means of escape for him. Thus to the very first proposals which Boxtel made to Gryphus to filch the bulbs which Cornelius van Baerle must be supposed to conceal, if not in his breast, at least in some corner of his cell, the surly jailer had only answered by kicking Mynheer Isaac out, and setting the dog at him. The piece which the mastiff had torn from his hose did not discourage Boxtel. He came back to the charge, but this time Gryphus was in bed, feverish, and with a broken arm. He therefore was not able to admit the petitioner, who then addressed himself to Rosa, offering to buy her a head-dress of pure gold if she would get the bulbs for him. On this, the generous girl, although not yet knowing the value of the object of the robbery, which was to be so well remunerated, had directed the tempter to the executioner, as the heir of the prisoner. In the meanwhile the sentence had been pronounced. Thus Isaac had no more time to bribe any one. He therefore clung to the idea which Rosa had suggested: he went to the executioner. Isaac had not the least doubt that Cornelius would die with the bulbs on his heart. William of Orange, that is to say, clemency. But for Rosa and William, the calculations of the envious neighbour would have been correct. But for William, Cornelius would have died. But for Rosa, Cornelius would have died with his bulbs on his heart. Mynheer Boxtel went to the headsman, to whom he gave himself out as a great friend of the condemned man; and from whom he bought all the clothes of the dead man that was to be, for one hundred guilders; rather an exorbitant sum, as he engaged to leave all the trinkets of gold and silver to the executioner. But what was the sum of a hundred guilders to a man who was all but sure to buy with it the prize of the Haarlem Society? It was money lent at a thousand per cent, which, as nobody will deny, was a very handsome investment. The headsman, on the other hand, had scarcely anything to do to earn his hundred guilders. 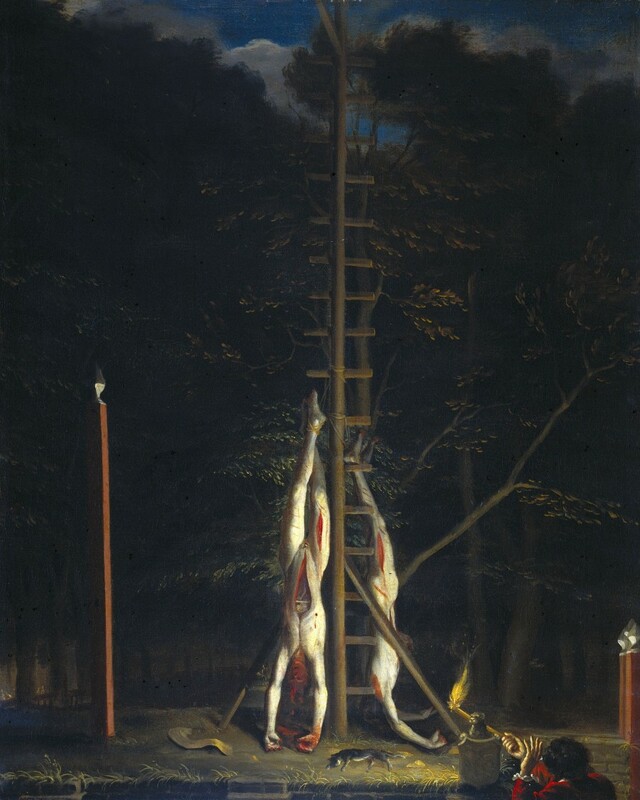 He needed only, as soon as the execution was over, to allow Mynheer Boxtel to ascend the scaffold with his servants, to remove the inanimate remains of his friend. The thing was, moreover, quite customary among the “faithful brethren,” when one of their masters died a public death in the yard of the Buytenhof. A fanatic like Cornelius might very easily have found another fanatic who would give a hundred guilders for his remains. The executioner also readily acquiesced in the proposal, making only one condition — that of being paid in advance. Boxtel, like the people who enter a show at a fair, might be disappointed, and refuse to pay on going out. Boxtel paid in advance, and waited. After this, the reader may imagine how excited Boxtel was; with what anxiety he watched the guards, the Recorder, and the executioner; and with what intense interest he surveyed the movements of Van Baerle. How would he place himself on the block? how would he fall? and would he not, in falling, crush those inestimable bulbs? had not he at least taken care to enclose them in a golden box — as gold is the hardest of all metals? Every trifling delay irritated him. Why did that stupid executioner thus lose time in brandishing his sword over the head of Cornelius, instead of cutting that head off? But when he saw the Recorder take the hand of the condemned, and raise him, whilst drawing forth the parchment from his pocket — when he heard the pardon of the Stadtholder publicly read out — then Boxtel was no more like a human being; the rage and malice of the tiger, of the hyena, and of the serpent glistened in his eyes, and vented itself in his yell and his movements. Had he been able to get at Van Baerle, he would have pounced upon him and strangled him. And so, then, Cornelius was to live, and was to go with him to Loewestein, and thither to his prison he would take with him his bulbs; and perhaps he would even find a garden where the black tulip would flower for him. Boxtel, quite overcome by his frenzy, fell from the stone upon some Orangemen, who, like him, were sorely vexed at the turn which affairs had taken. They, mistaking the frantic cries of Mynheer Isaac for demonstrations of joy, began to belabour him with kicks and cuffs, such as could not have been administered in better style by any prize-fighter on the other side of the Channel. Blows were, however, nothing to him. He wanted to run after the coach which was carrying away Cornelius with his bulbs. But in his hurry he overlooked a paving-stone in his way, stumbled, lost his centre of gravity, rolled over to a distance of some yards, and only rose again, bruised and begrimed, after the whole rabble of the Hague, with their muddy feet, had passed over him. One would think that this was enough for one day, but Mynheer Boxtel did not seem to think so, as, in addition to having his clothes torn, his back bruised, and his hands scratched, he inflicted upon himself the further punishment of tearing out his hair by handfuls, as an offering to that goddess of envy who, as mythology teaches us, wears a head-dress of serpents. On the 20th of August, 1672, the city of the Hague, always so lively, so neat, and so trim that one might believe every day to be Sunday, with its shady park, with its tall trees, spreading over its Gothic houses, with its canals like large mirrors, in which its steeples and its almost Eastern cupolas are reflected,–the city of the Hague, the capital of the Seven United Provinces, was swelling in all its arteries with a black and red stream of hurried, panting, and restless citizens, who, with their knives in their girdles, muskets on their shoulders, or sticks in their hands, were pushing on to the Buytenhof, a terrible prison, the grated windows of which are still shown, where, on the charge of attempted murder preferred against him by the surgeon Tyckelaer, Cornelius de Witt, the brother of the Grand Pensionary of Holland was confined. the whole town was crowding towards the Buytenhof, to witness the departure of Cornelius de Witt from prison, as he was going to exile; and to see what traces the torture of the rack had left on the noble frame of the man who knew his Horace so well. Yet all this multitude was not crowding to the Buytenhof with the innocent view of merely feasting their eyes with the spectacle; there were many who went there to play an active part in it, and to take upon themselves an office which they conceived had been badly filled,–that of the executioner. There were, indeed, others with less hostile intentions. All that they cared for was the spectacle, always so attractive to the mob, whose instinctive pride is flattered by it,–the sight of greatness hurled down into the dust. That ominous mob got its spectacle this date in 1672, lynching the Dutch Republic’s longtime de facto head of state, Johan de Witt along with his brother Cornelis/Cornelius. 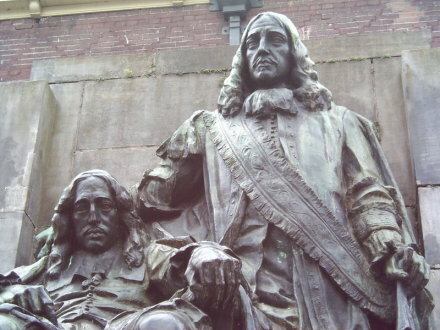 A statue of Johan (standing) and Cornelis de Witt in their native Dordrecht. The mercantile powerhouse that was the 17th century Dutch Republic was the stage for a long-running conflict between the Orange monarchists (hence the soccer uniforms) and the Republican merchant class. With the sudden death of the young William II, Prince of Orange in 1650, leaving the (non-hereditary) executive office of stadtholder vacant, the Republicans became ascendant. And the outstanding figure of the First Stadtholderless Period was Johan de Witt, scion of a Dordrecht merchant family powerful enough that William II had imprisoned de Witt’s own father during a power struggle. Elevated in 1653 and at the tender age of 28 to the leadership position of Grand Pensionary, Johan de Witt’s “eloquence, sagacity and business talents” guided the Dutch ship of state for essentially the remainder of his life. This was the apex of the Dutch Golden Age. The Dutch East India Company dominated Asian trade routes,* and the Low Countries’ culture thrived on the wealth: Rembrandt and Vermeer were at the height of their talents; Spinoza revolutionized philosophy; van Leeuwenhoek invented the microscope. While all these guys were landing themselves in their respective canons, Johan de Witt was trying to keep the age Golden. Having only relatively recently broken free of Spain, the small country was an up-and-comer on the horns of a serious security dilemma: its leading commercial position put it into maritime competition with England, while its continental location made it vulnerable to the enormous army of the neighboring continental hegemon, France. Ultimately, even with its trade wealth, it did not have the resources to keep up with both of western Europe’s leading powers. A decade and a Stuart Restoration later, de Witt maintained (mostly) Dutch dominance of the seas in the Second Anglo-Dutch War, then held off France (with the help of a timely alliance with the recent adversary, England) in the War of Devolution. In each case, he kept at least one of England or France on the sideline, or in his own camp. But the Third Anglo-Dutch War was the charm — as it was also the Franco-Dutch War, and therefore 1672 was Rampjaar: disaster year. While the Dutch were aces on the waves, a massive French invasion easily overwhelmed them on terra firma. 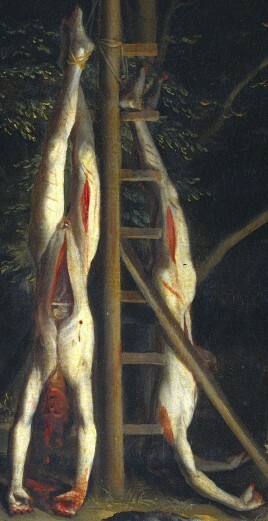 Detail view (click for the full image) of a grisly painting of the mutilated de Witt brothers strung up at The Hague. It’s attributed to Jan de Baen, who in better times took Johan de Witt’s portrait. De Witt’s never-beloved mercantile oligarchy speedily collapsed with the military reverses, and the now all-grown-up William III was there to pick up the pieces to popular acclaim. Arrested for treason, Cornelis sustained torture without confessing, but when Johan visited him in prison — and William III incriminatingly withdrew the cavalry protecting the brothers — the mob quenched its fury with the de Witts’ blood. every one of the miscreants, emboldened by his [Johan’s] fall, wanted to fire his gun at him, or strike him with blows of the sledge-hammer, or stab him with a knife or swords, every one wanted to draw a drop of blood from the fallen hero, and tear off a shred from his garments. And after having mangled, and torn, and completely stripped the two brothers, the mob dragged their naked and bloody bodies to an extemporised gibbet, where amateur executioners hung them up by the feet. Then came the most dastardly scoundrels of all, who not having dared to strike the living flesh, cut the dead in pieces, and then went about the town selling small slices of the bodies of John and Cornelius at ten sous a piece. The word “ungrateful” comes to mind. De Witt stood altogether on a lower plane than Cromwell. We regard him rather as a man of rare and singular talent, than as one of the chosen great ones of the earth, which Cromwell was. He stands far above the common run of men; and he was head and shoulders above nearly all the notable men of his time. He would have been greater if the movement of his limbs had been less burdened with the Dutch governing apparatus … He is not one whom the world can ever greatly admire or love. –History of the administration of John De Witt, grand pensionary of Holland, a Google books freebie. The rise of William III came with the decline of that Dutch Golden Age: the country fended off the immediate military threat, but it increasingly slipped behind its larger neighbors. Costly as was the Franco-Dutch War, it is a step on the path towards the present-day Europe, and this gives us enough excuse to notice that the Eurovision lead-in tune is actually from a Te Deum composed to mark its end. * The Dutch remained the sole western contact of closed Japan until 1854, which is why Japan’s eventual period of scientific advancement became known as ‘Dutch Learning’. ** Albion did not forget the de Witts, either: according to this 1785 cant dictionary, the term “dewitted” had a 17th-18th century run in English to denote — well, exactly what happened to Cornelis and Johan.